Across America, groups are enclosing themselves in bubbles that protect them from competing points of view, even from disturbing information. This has always happened to some extent; it’s easier to be with people who share your views. Is it any wonder that in many ways American college campuses have become a symptom of the parochialism that plagues our public culture? Parochialism would be bad enough, but we have seen not just a narrowing of our national discourse but a coarsening of it. Vitriol scores much more attention than civility, and for more than a decade we have put a premium on measuring how much attention—how many “eyeballs” or “clicks”—one can get. Ironically, total disparagement of those with whom one disagrees is more easily “shared” on social media than sorting through where one might have points in common as well as differences. Demonizing people because they have ideas different from your own has always been a temptation, and in recent years it has become a national contagion. College campuses are not at all immune from it, but this malady is fatal for liberal education. Many people are so accustomed to curated information—be it from social media feeds or just from one’s choice of cable news—that they have lost the ability to respond thoughtfully to points of view different from their own. Instead of seeing disagreement as an occasion for learning, many today have become so unaccustomed to robust exchanges of ideas that they feel threatened when confronted with information and arguments with which they may disagree or with which they are simply unfamiliar. This is anathema to pragmatic liberal education, a broad, contextual form of learning that has been the hallmark of American higher education at its best. That’s why at Wesleyan we are doing our best to counteract this trend. Instead of training our students to call out as “morally inferior” those people with whom they have intellectual differences, we are cultivating curiosity and openness. We continue to highlight and enhance the consideration of alternative perspectives on culture and society; we promote vigorous debate that doesn’t degenerate into personal attack. This kind of consideration and debate is increasingly rare in the public sphere, and that’s why it is more important than ever to cultivate the terrain for it on campus. By encouraging intellectual diversity and debate, I don’t mean inviting provocative entertainers to campus so as to get free-speech points at the cost of providing a platform for idiocy and abuse. I mean enhancing conditions for the serious study of alternative visions of justice, freedom, individual rights, and communal responsibilities. I mean not just sharing biases with students in acts of solidarity, but testing one’s biases by also engaging with ideas that challenge the campus consensus. In the late 1960s, many schools steered away from enforced homogeneity and toward creating a campus community in which people could learn from their differences while forming new modes of commonality. This had nothing to do with what has come to be called political correctness or even identity politics. It had to do with preparing students to become lifelong learners who navigate in and contribute to a heterogeneous world after graduation. Today we must ensure that intellectual diversity is part of this mix. Inquiry, collaboration across differences, and courageous experimentation require freedom of thought, freedom of speech, and the free circulation of ideas. Conformity is the bane of a liberal education that thrives on deepening one’s ability to learn from people with whom one does not agree—an ability all the more important today. New provincialisms and nationalisms are gaining force through fear-based politics; such orchestrated parochialism is antithetical to liberal learning, and liberal learning is one way to counteract it, regardless if one is on the left or the right. The students on campus today, like those who have studied at Wesleyan across the generations, are stimulated by intellectual, aesthetic, and political differences; they develop habits of mind and spirit to treat those differences as assets for learning. And assets for learning become touchstones for work in the world that makes a positive difference. At Wesleyan we must continue to re-articulate the goals of liberal learning for both our students and our sector of higher education. 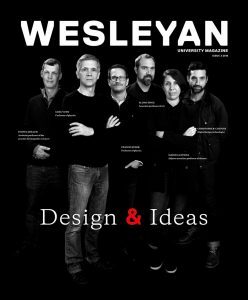 We must continue to send “Wesleyans” out into the world to translate their education into action—to model for others the values of inquiry and conversation, the courageous pursuit of truth, and the compassionate use of the fruits of one’s labor. This translational liberal education re-articulates the goals Willbur Fisk set for the institution long ago: the good of the individual and the good of the world. Worthy words and aspirations then and now.